We're excited for the arrival of football season, especially college football. While we no longer live in our home town, it's still the team that we root for every single year. This year we are looking forward cheering on our team, and having a lots of good times with friends and family as we sweat it out in front of the TV. Nothing says game day like good food and drinks, and this college football season the family and I are stocking up at our local Dollar General for everything we will need for game day. I love how convenient having a Dollar General only two blocks from home is. 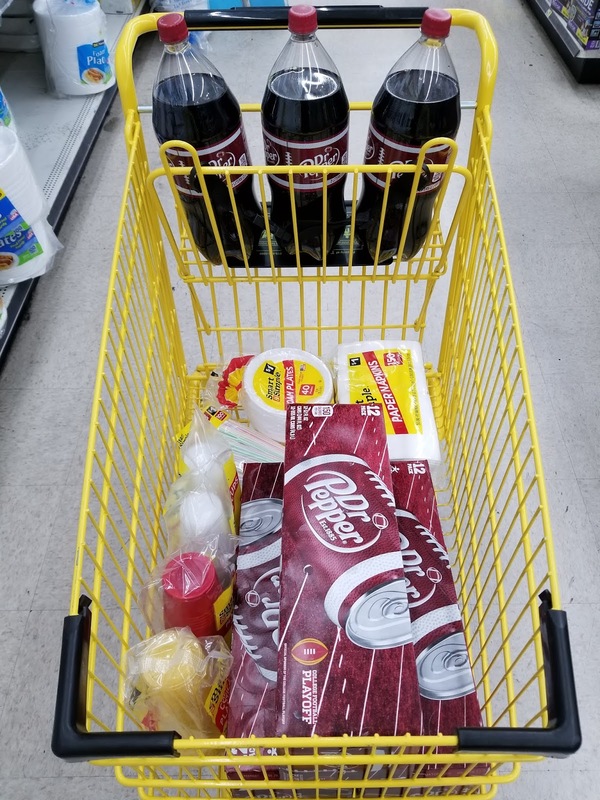 It's so quick and easy to pop in for all our game day watching needs: paper towels, napkins, serve ware and of course Dr Pepper®. We're a pretty large family so it's important to me that I can stock up for extra savings of Dr Pepper at Dollar General. Plus all the other Dollar General brand essentials we need are also super inexpensive, most only $1-$2. My budget definitely goes a long way by shopping there. Dr Pepper is the perfect drink for watching college football because of its rich, indulgent, one of a kind flavor. It's super versatile when it comes to pairing it with sweet and savory dishes (my favorite), including the really simple appetizer I am sharing below. Instructions: Prepare mango cubes. Then in a large skillet heat oil, adding garlic and stirring for a minute or less. Add shrimp, salt and pepper, stirring for another minute. Lastly, add Sriracha sauce and cook for another 2-3 minutes. Cooking time for the shrimp should be no more than 5 minutes total - unless you're working with raw shrimp. Plate by inserting a shrimp and one cube of mango on a toothpick. Serve hot or cold and don't forget to add a cold glass of Dr Pepper. And as easy as that I have a sweet & spicy appetizer that the family will enjoy and it didn't take me very long to prepare it. This is exactly my kind of dish - something quick and easy yet super flavorful. I will leave the heavy tailgate-style cooking to the professionals (the guys).